Although upsetting, I’m at peace with this. One reason is because I can only assume there would have been an enormous amount of backlash if the film did get shortlisted. Most likely The Academy would have been getting threatening messages urging them to pull The Red Pill from the lineup, or petitions would have been started to protest the Oscars, etc. Although these types of petitions have given the film more publicity in the long run, they also perpetuate many hateful lies about the film which can be difficult to correct and set straight. Another reason I’m at peace with The Red Pill not making the Oscar Shortlist is because this film was not created with the intention of winning awards, the film was created to elevate the discussion around gender politics. Qualifying The Red Pill movie for the Oscars meant that the film was seen by hundreds of Oscar jury members. I’m certain the film inspired many conversations amongst those Oscar members, and for that, I am grateful that the film was in the running! Cassie Jaye herself will attend the Norwich and Birmingham screenings for the Q&A. As regards general release, Cassie Jaye has signed a deal with a distributor to release TRP worldwide on-line, and as DVD/Bly-Ray and Video-On-Demand via platforms like Netflix, Hulu, iTunes, Amazon, etc. It is currently anticipated that this will happen in March 2017. Cassie Jaye will be speaking at the International Conference on Men’s Issues in Gold Coast, Australia on June 9th. This entry was posted in book/film reviews on 22nd December 2016 by William Collins. I wonder how the short-list is decided on. With 145 entries, this will presumably be in the region of 200-250 hours solid viewing, which is far too much for any one person, certainly in the time between the closing date and the announcement of the short-list. Maybe someone can enlighten us whether it is likely that the jury have watched the film, or at least a significant part thereof. I have enjoyed her youtube pieces. 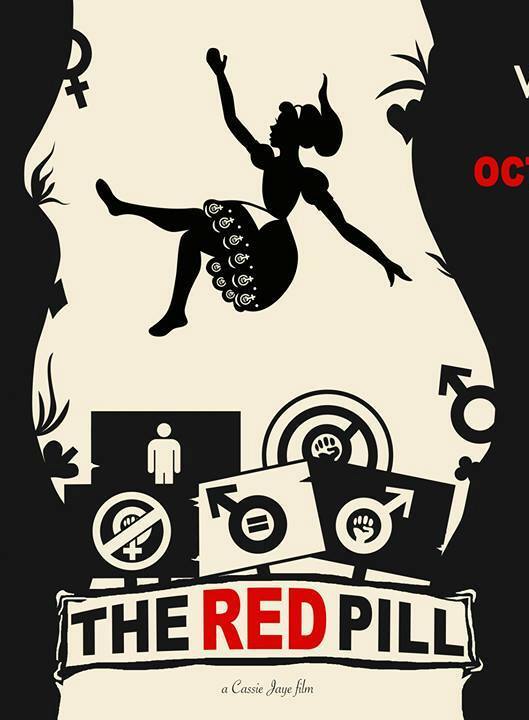 I certainly hope the Red Pill gets a wide audience. I certainly hope its Director gets recognition to continue her work. To me her story is all the more powerful because she isn’t a “convert” and not a MRA. Simply someone open to investigating different views and calling out censorship. In a way that shows up the protestors even more. I guarantee that when this film becomes available for download Cassie Jaye will become a megastar – and probably a millionaire – overnight. Feminists have spent decades gaining control over the media so they can control the narrative and suppress films like this. The internet makes all that work irrelevant, and any attempt to suppress films like this futile. I will be downloading it via iTunes or Amazon the second it becomes available, and I hope Cassie Jaye gets very rich. Apparently, the world is not ready for the truth. There is way too much money to be stolen by continuing the feminist lies. There is one thing I can guarantee; what ever documentary wins the Academy Award, it will not be a patch on The Red Pill. Marvellous news. I look forward to seeing it on Netflix. I am not surprised that TRP did not get chosen for an award because those of us who work in the field forget just how controversial this film is and Cassie is right an establishment institution will not give an award to an incendiary film and risk the controversy however the fantastic news is that TRP will now be available world wide and that is the best news that Cassie has given us for Christmas. May everyone everywhere have a peaceful Christmas and a special prayer for those of you who are without your children. Couldn’t let this opportunity . May I say what an inspiration you have been right from the days you were in the news with the early Refuge’s. God bless you.